Just a small post (with a tiny cellphone photo) to celebrate talented 12-year-old sketcher, Mariah, who loves to draw and paint. For Christmas I gave her the accordion-fold Moleskine above along with some acrylics and brushes. 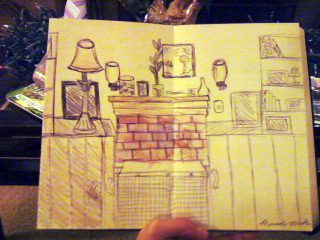 She texted me this drawing last night, an excellent rendition of her living room. 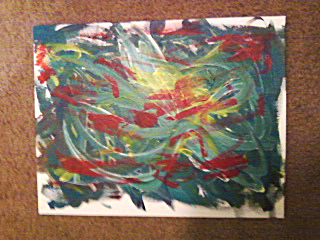 Above is another recent picture in a text message I received from Mariah showing me her latest acrylic abstract. She’s famous for her beautiful tropical beach and mountain paintings but now is exploring abstract (expressionist?) painting too. Good for you for supporting and inspiring her!! !